Happy Saturday! For all you Circlets out there I hope you stopped by the Circle Blog to check out the project I shared there today! 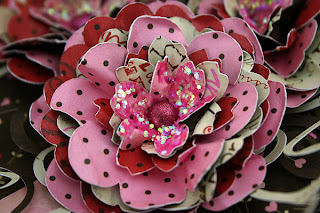 It is a home decor project that has a bit of a love theme to it! I also hope you find some inspiration for your next project as you check it out! 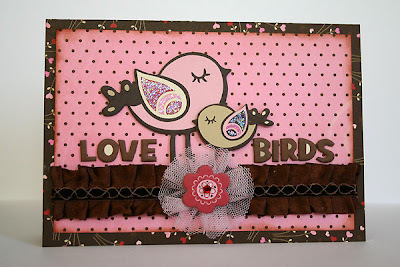 For those of you stopping by here today I am sharing a couple of my recent Bo Bunny projects! This card and the treat box below are for my husband for Valentine's Day! Hopefully he won't check out my blog until after he gets them! I used the Crazy Love collection. I really love the pink and chocolate brown color combo! For this treat box I covered a box of chocolates that my MIL sent us for Christmas and I filled it with dark chocolate Ferrero Rocher! Yum-mee!!! I used the Cindy Loo Cricut Cartridge to create the swirls and the Mother's Day Bouquet Cartridge for the flowers. These have definitely become 2 of my go to cartridges for crafting these days! To create the flowers I cut out multiple flower shapes in gradually decreasing sizes. (The largest flower is 3 inches) I then lightly misted each flower with water and crumpled it. I then used my heat gun to dry them and help them keep there newly found shape. 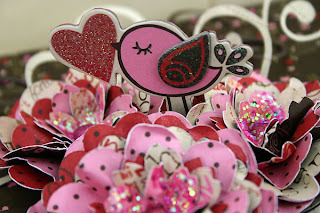 I then layered them and added the brad and glitter to create the centers. Ahhhh...a up close peak of the yumminess!!! Here's hoping you have a wonderful weekend and a very Happy Valentines Day! Thanks for stopping by! Beautiful projects!!! I love love love the flowers on the box of chocolates. So much dimension and that cute little bird popping up. Love it! What a stunning card and box! Just beautiful! I saw that box over on the Bo Bunny blog and IMMEDIATELY knew you had made it! It's stunning! HUGS! 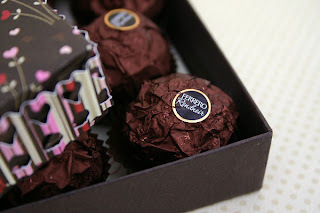 Thank You so very much for your lovely comment on my blog! I appreciate you taking the time to write something positive and encouraging! 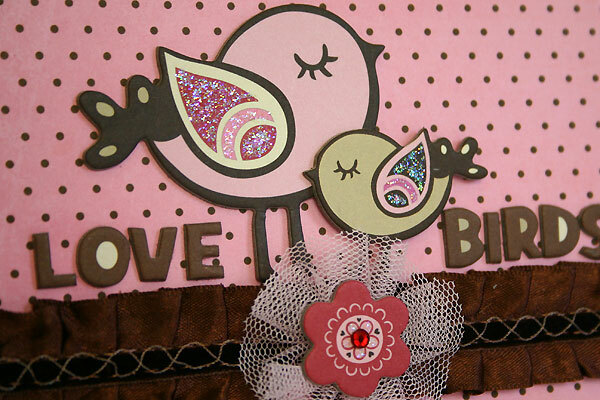 Lovely cards and projects here too! Love them! Take care, Nadia! 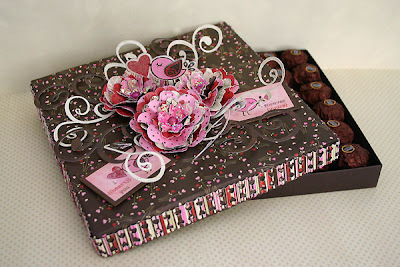 Beautiful candy box -- love those flowers!!! Beautiful projects!